The EAST project stretches back to 2011 when some 100 academic and research libraries across the Northeast began planning a collaborative regional program that would focus on managing retention commitments for infrequently used monographs and journals. The project’s implementation phase began in 2015 with funding from both the Andrew W. Mellon Foundation and the Davis Educational Foundation. As of summer 2016, 48 libraries (see http://www.eastlibraries.org/members for details) are participating in EAST, which the Boston Library Consortium manages as the administrative host. The EAST team consists of Susan Stearns and Anna Perricci; Sara Amato, Data Librarian; and Matthew Revitt, Shared Print Consultant. Lizanne Payne served as the Shared Print Consultant until she was appointed to a full time position with HathiTrust in the spring of 2016. Following the formal kickoff of the EAST project in June 2015, the EAST team began work with OCLC Sustainable Collection Services (SCS) on the large-scale collection analysis which would be critical to selecting the titles to be retained. The participating libraries provided SCS with extracts of bibliographic and item date for in-scope monographs as well as circulation data by the end October, 2015. SCS then normalized the data and performed a variety of matches of the data against comparator groups that EAST had identified: HathiTrust, WorldCat, major research and college libraries in the Northeast that are not EAST members, and ConnectNY and Maine Shared Collections Strategy, EAST participants which had retention commitments in place already. This collective EAST dataset was then loaded into SCS’s online system, GreenGlass, and made available to the participating libraries and the EAST team to begin the process of analysis and building a retention model. As those of you who have used it know, GreenGlass is a powerful, highly interactive tool that can be somewhat addictive. For many of the EAST libraries, GreenGlass provides considerably more insight into their local circulating print collections than they had previously. Many EAST libraries will continue to use GreenGlass in support of collection development and local deselection activities after the EAST retention commitments are in place. Over the course of a quite intensive three-month period, March through May 2016, the EAST team worked with SCS and the EAST Monographs Working Group (MWG) to develop potential retention models using tools in GreenGlass. Early on, the MWG, and later the full membership, endorsed the tenet that EAST should retain at least one copy of titles that met the retention model and wanted to focus on retaining more than one of titles that were scarcely held by the comparator groups as well as those titles with significant usage by the member libraries. retain one copy of all other titles that are defined as in scope in order to protect the remainder of the collective collection. Applying this model to the EAST collective collection resulted in EAST Retention Partners agreeing to retain approximately 36% of their local in-scope collections, though some libraries offered to retain significantly more. This resulted in the 40 EAST Retention Partners committing to retain over 6 million holdings representing over 4.3 million titles. As those familiar with shared print initiatives know, the issue of validation — verifying the existence and in some cases the condition — of retained items is often not feasible. Such validation, however, can be critical to building trust, particularly with academic faculty, in programs such as EAST. The size and geographic distribution of the EAST member libraries made a full scale validation program impossible. Fortunately, with funding support from the Mellon Foundation and working with an outside statistical consultant, EAST was able to implement a sample-based validation study. This study involved creating a random sample of 6,000 titles (drawn from the data extract provided to SCS) for 40 of the EAST Retention Partner libraries for a total of 240,000 titles. Using a data collection tool developed by the EAST Data Librarian, Sara Amato, each library was asked to check these items locally to determine an “availability metric.” In addition, a cursory review of the condition of the items was performed by the workers. Each library was provided a set payment, from the grant funding, for this work. To support the work of the libraries in this study, Sara worked closely with members of the EAST Validation Working Group not only on the design of the data collection tool but also to develop documentation and training materials for the workers performing the study. This work and the code are available on GitHub (https://github.com/samato88/EastValidationTool), and we invite libraries who are interested in using the tool to do so and provide us with feedback. 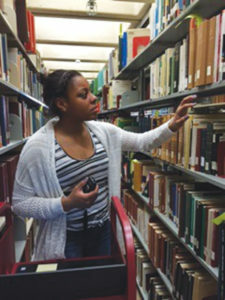 The participating libraries determined independently how to accomplish the work of the study: most used student workers (as shown in the photo). Some used library staff or a mix of library staff and students, at least one used a library science student (who tended to be more critical of an item’s physical condition). While we did not collect the time required of each library in a structured way (but will certainly do so in future studies), reports from the participants indicated an average of 46 books could be checked per hour with a minimum of 29 and a maximum of 102. The average administrative overhead reported was 24.3 hours. While these numbers are only estimates, they would tell us that replicating the study with a sample size of 6,000 would require about 130 hours of the time of workers and 24 of staff overheard for a total of 154 hours. We are planning a second validation study for late 2016. While the details of this study have yet to be finalized, we expect to drill down into the data set from the initial validation sample. We will first identify the subset of the 240,000 samples that represents actual EAST retention commitments. Using additional data fields provided by SCS, we will look at questions such as: what is the impact of publication data on condition? how does aggregated circulations impact the likelihood that an item is available? are particular class numbers more or less likely to be available? The goal here is to determine whether or not validation studies such as this could provide useful information that might influence future retention models — for EAST or for other shared print initiatives. So, stay tuned. As the first full year of EAST comes to a close, we still have much to do. Major operating policies for EAST, based on those discussed in EAST’s planning phase, have been approved by the Executive Committee and shared with EAST’s members. Drafting of the Memorandum of Understanding (MOU) for EAST is being led by Matthew Revitt and members of the Monographs Working Group (MWG). This MOU is expected to be ready for Executive Committee approval by the fall of 2016 and, once approved, made available to partner libraries. As of this writing, we are working to develop documentation for the Retention Partners that will ensure they can appropriately disclose retention commitments in their local catalogs to prevent retained items from being inadvertently discarded. Active planning for opening up EAST membership to new libraries is underway. We expect to provide seed funding to a second cohort for collection analysis and hope to continue to add to the six million EAST retained titles. A number of the libraries involved in the early planning for EAST that were not able or chose not to join the first cohort have already indicated their interest, as have libraries in other parts of the Northeast (and possibly even further south). We would like to see another 20+ libraries join EAST in 2017 and are reasonably confident we can, with the additional grant funding available and a set-aside of funds from the current membership fees, underwrite a significant portion of the collection analysis for new as we did for current members. New EAST members would not only gain the benefits of participation in the collection analysis but would be able to access materials from other EAST member libraries for local use, would be in a position to withdraw titles locally in a responsible fashion, and be given a voice in the future of EAST and in shared print regionally and nationally. We are also eager to continue validation sampling, as we believe it can provide valuable input into retention modeling and further the confidence that academic faculty and administration have in programs such as EAST. And, while today each shared print initiative has its own set of retention rules, EAST has shown that consensus can be reached among partners with a diverse range of needs, institutional sizes, type, etc. We hope and expect EAST to grow and prove the sustainability of large-scale regional shared print programs. We anticipate that the important preservation role EAST and other shared print programs play in maintaining access to the scholarly record will have an impact for generations to come. We see EAST as one of a number of evolving threads in what will likely be a colorful tapestry of shared print across the nation (and possibly beyond). And, we recognize that while we want to continue to expand the membership of EAST, there are likely many different shapes such a tapestry may take. We expect a growing number of libraries will participate in multiple programs and be willing to extend existing retention commitments widely. We recognize that some libraries — particularly larger institutions with well-established resource sharing partners — will wish to understand the impact of joining initiatives such as EAST before contributing their collections. And, we realize that new models, such as the HathiTrust Print Monograph Archive (with slightly different goals), will evolve that may both complement and compete with regional shared print efforts like EAST. We were pleased that the EAST libraries took a broader view than some expected. For example: having guaranteed access to a copy within the larger region was more important than geographic distribution of multiple copies. Is this perspective likely to continue as EAST grows and expands in geographic area? As EAST and other programs expand the reach of retention, are there a set of general policies that can be agreed to that would facilitate further cooperation? If a national (or beyond) eco-system of shared print programs with some form of resource sharing existed, what would it mean to your library? Do you envision collection development to be impacted by such shared print programs? Will regional or other consortial or collaborative relationships among libraries begin to truly impact collection development? Is so, what are the implications of this for scholarly publishing? How does collection analysis need to evolve to support the growth of shared print? Should EAST and other programs assume such an analysis needs to be done on some regular basis to accommodate new acquisitions? Is this financially feasible? How does it influence or how is it influenced by any growth of truly collaborative collection initiatives? How will resource sharing change? Do libraries and library consortia need to begin to evolve a new infrastructure to support resource sharing on a larger scale? What role might increased digital delivery play in efficient operations? And, the beat goes on…… We look forward to the continued evolution of shared print projects and to working together as a community. Libraries or library consortia interested in addressing these questions or joining EAST as part of the second cohort should reach out to Susan at <sstearns@blc.org> or Anna at <aperricci@blc.org>. EAST’s initial focus has been monographs though journals and serials are in scope for EAST and planned for the future. A title set is an SCS term used to describe all the holdings of a particular title. Across a collective such as EAST, a title set can have one or more associated title holdings.